Everyone has a favourite run, right? 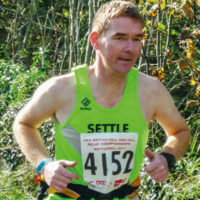 And surely that question is easy to answer for Pete Ellwood, who has just written a running guide, Trail and Fell Running in the Yorkshire Dales. Actually, it’s not. I’ve been running in the Dales for years. I’ve raced, walked, mountain biked and kayaked here. I have a long-standing obsession with looking at maps and then disappearing off to find obscure features of the landscape, such as Juniper Gulf on Ingleborough or Cosh Outside. Ironically, the more routes you do, the harder the question becomes to answer. All the runs in Trail and Fell Running in the Yorkshire Dales are ones that I consider to be fantastic, otherwise they wouldn’t be there. When I started writing the book, I thought it would be easy to compile. 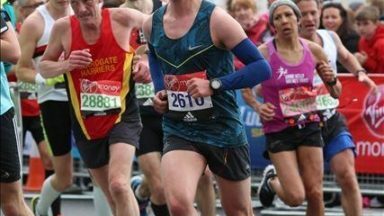 However, having got to about 25 routes and with only a few more on the ‘to do’ list, I began to think that I might struggle to find 40 ‘excellent’ routes that would be worthy of inclusion and that other runners would find appealing. The answer lay with maps: an evening spent perusing found me not only a good 40, but perhaps enough for a second book! The runs come from three main sources. First, there are those from popular areas, such as the Three Peaks or Bolton Abbey; places that everyone goes to, and quite rightly so for the scenic value alone. Second, is a group of runs that I consider to be my own personal routes. These are ones that I made up myself and tend to run alone or with a small number of friends; examples include Barbondale and Cosh. They often link the more remote or secluded places in the central, southern or western Dales. The third and final section are those runs that I developed and created specifically for the book, such as Arkengarthdale and Maiden Castle. 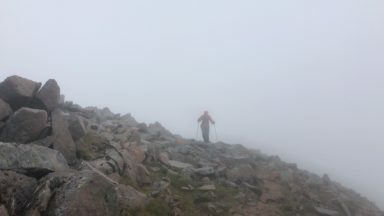 Ultimately, many factors play a part in answering what my favourite route is: closeness to home (I have two boys of eight and 10 and a full-time job), the level of navigation required, the challenge provided by location or difficulty, my personal history or attachment to a route and my age! I am also sure that the ‘reasons’ list today is different to what it would have been 20 years ago. More exploration and the ‘journey’ experience and less ‘knocking off’ the peaks! So here are the top contenders, with a reason… well, my reason! This is always high on my list. 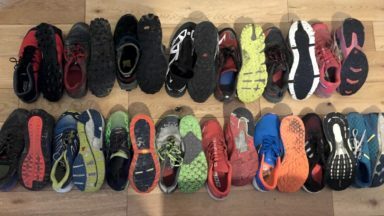 In my younger, more competitive, days my running mates and I used to train for mountain marathons, which usually included a couple of 1000ft ascents on day one, and often first thing on day two as well. So, we would climb straight up the northern side of Carlin Gill, move along 100 metres, descend back to the beck, climb the southern side, move along to descend again, re-climb the northern side and continue this pattern to the head of the valley. Ultimately, this would bring us to the foot of Black Force, following the small path to The Spout. Climbing out from the foot of the waterfall brings you to a small remote river valley leading to one of the grassy ridges of the Howgills. 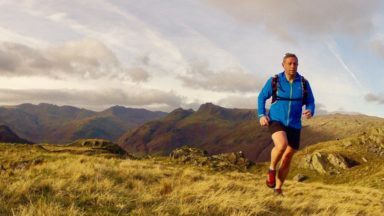 A short circular of Docker Knott and Fell Head leads down a fast, grassy, soft descent – what more could a fell runner ask for – back to the start. 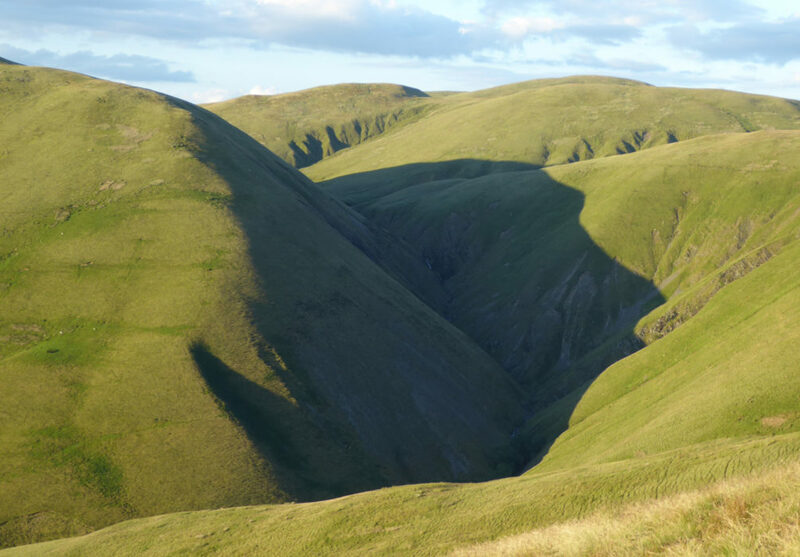 Black Force typifies what is best about the Howgills: running on soft, grassy paths; steep ascents and descents that make your muscles burn either way; and wonderful running on undulating ridges. 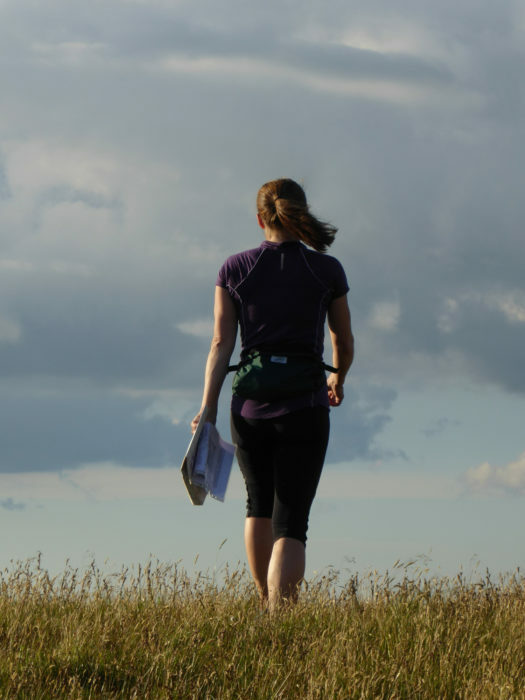 The cover photograph for my book comes from this route and was taken as Jess, my friend from Settle Harriers, was checking the route description. We set off after work one July evening and the light was just perfect for taking photographs and running. The whole of the southern Lakes and Morecambe Bay were lit by sunlight. Just fabulous. 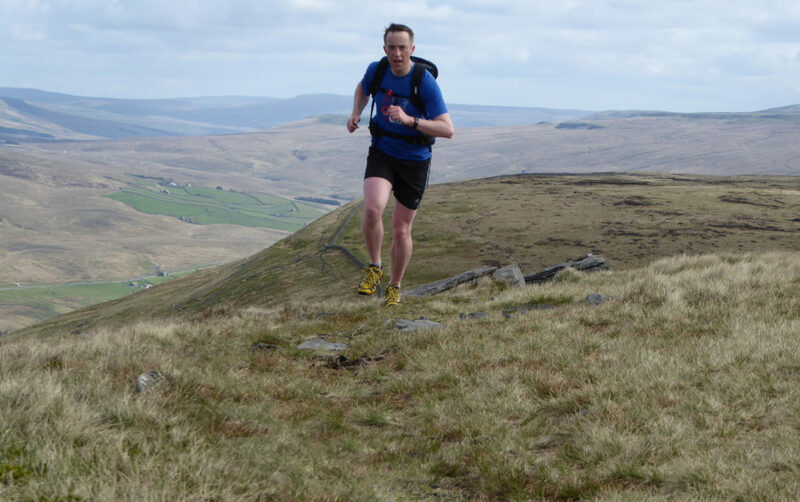 I have completed many mountain marathons and races in the Howgills. I can vividly remember ascending from Ravenstonedale in the north, up the grassy slopes in the mist for the first time to the tops, before the cloud lifted for a short time, revealing the fantastically steep grassy valleys of the central Howgills. So Black Force is definitely a contender for those memories as well. This gets in because it is probably my most regular run up a mountain. It is only a short distance from home. As it says in the book introduction, Pete has a ‘daily view of Ingleborough to keep him company’. 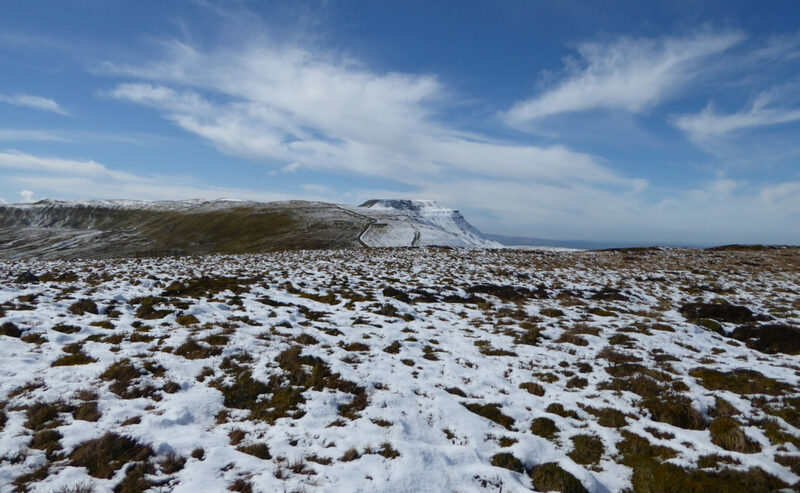 This route has other attractions too, not least one of the best views in the Dales – that of Ingleborough’s northern face from the small path that runs along the escarpment towards Park Fell. The route is straightforward to run, starting with a short grassy section through three fields before climbing through the limestone pavement past Braithwaite Wife Hole to the edge of the mountain proper. The climb up to the escarpment foot is on old flagstones reclaimed from the mills of northern England. This brings back childhood memories being brought up in such a mill on the outskirts of Bradford and I cannot run over these Strava ‘slabs of doom’ without buoyant memories of my upbringing. 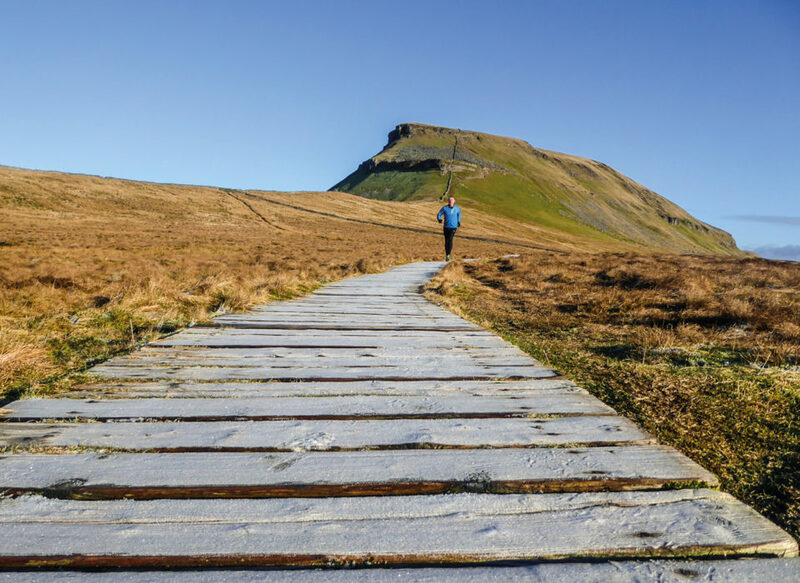 Additionally, I recognise that although they don’t necessarily fit into the landscape, they are a massive improvement on the wide muddy path that I remember from the first times I ascended Ingleborough, when erosion was causing massive damage to the fell side. I use the escarpment and the section to the summit plateau as a measure of my fitness. Occasionally, I have been able to run all of it. The challenge of navigating the summit plateau in poor visibility is well known. Generally, I think my level of navigation, coupled with my local knowledge, is good, so it is with a wry smile that I sometimes struggle to find the trig point. In my defence this only ever happens in the dark and in thick cloud! I can always find my way to the summit shelter cross, by experience and feel alone. There are occasions when the visibility is so poor that I miss the cairn. Rather than wander around for ages trying to locate it, I will return to the northern edge of the plateau to follow the return path along the escarpment. In daylight, I consider the run away from the summit as one of the best single miles of running in the area: flat but undulating on a small path with one of the best mountain views in the Yorkshire Dales for company. So Ingleborough could be ‘tops’ for proximity, iconic mountain status and the frequency that I run up it. This is my favourite short trail run. The sheer breath-taking beauty of the limestone scenery makes it hard to beat. Formed from the tiny remains of crustaceans long ago, the run features two of the Dales’ most popular locations. As a run, the splendour and magnificence increases the further you go. Starting with a gentle trot alongside the beck, the route soon enters the woodland gorge that leads to the waterfall of Janet’s Foss; the waterfall of the queen of the fairies. A short distance later, you enter the visually stunning bowl that is Gordale Scar. A short scramble leads to a second amphitheatre, complete with a natural rock arch and waterfalls. A steep climb leads on to pleasant grass running to the high point of the route at Malham Tarn. The return leg is equally striking, descending as it does through an impressive dry valley to reach the large expanse of limestone pavement that is the top of Malham Cove. The pavement, with splendid clints and grikes geology, is home to many species of plants that are usually found in woodland. A steep flight of steps takes you to the bottom of the cove and it is always worth a short detour to the very bottom of the 300ft cove to marvel at the climbers who use the cliff, or to look at the pure waters of the small beck that issue from its base. So Malham and Gordale is a runner for ‘best route’ because of the stunning limestone scenery: so much packed into such a short run. This also makes the favourites list because it’s an impressive mountain on a large scale. 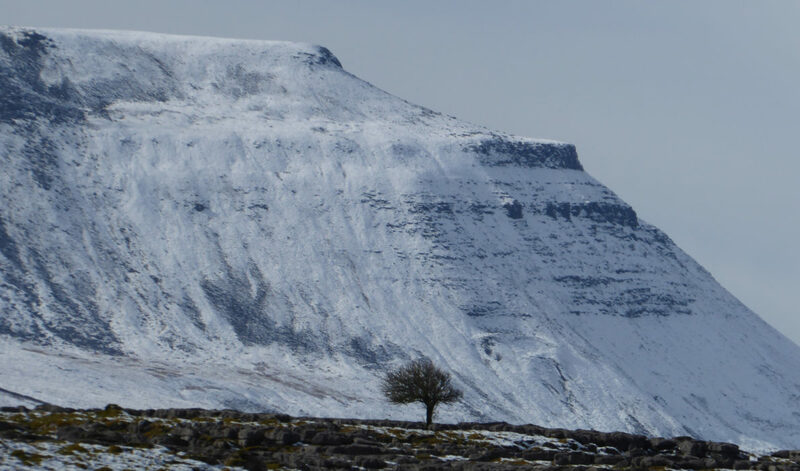 It is remote and challenging and nearly the same height as Ingleborough and Whernside. 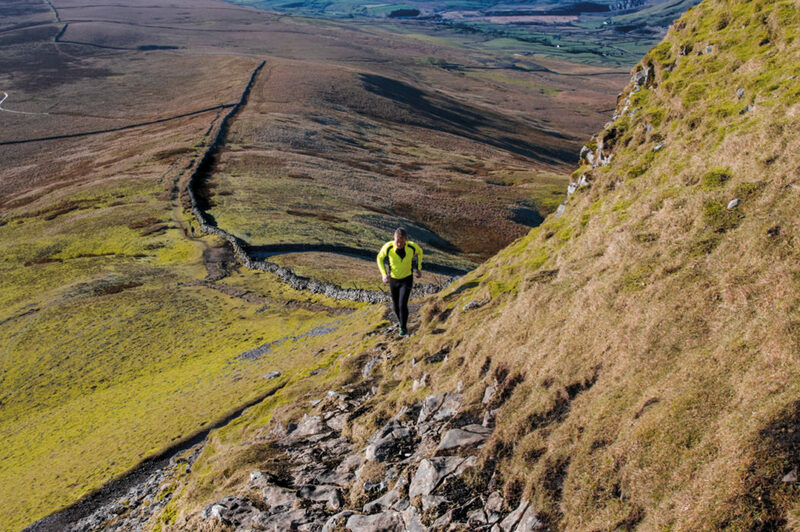 Running the route onto Wild Boar Fell gives you that real mountain running experience – one where you need to concentrate and focus on the route. 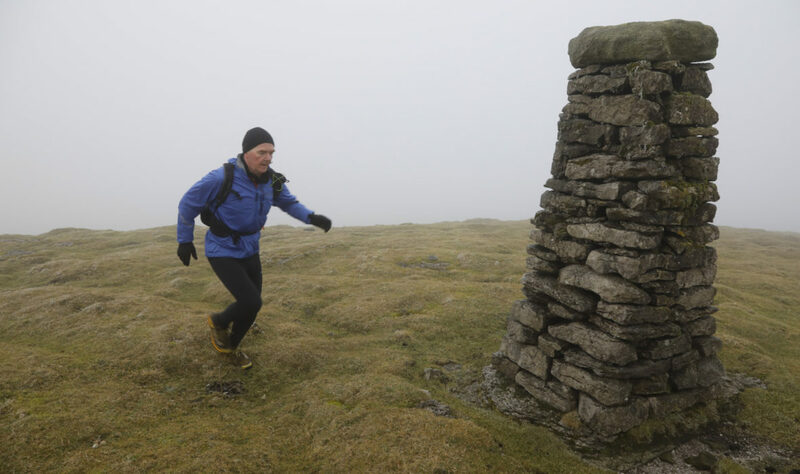 The run starts at the county border in remote Mallerstang and is simply beautiful. 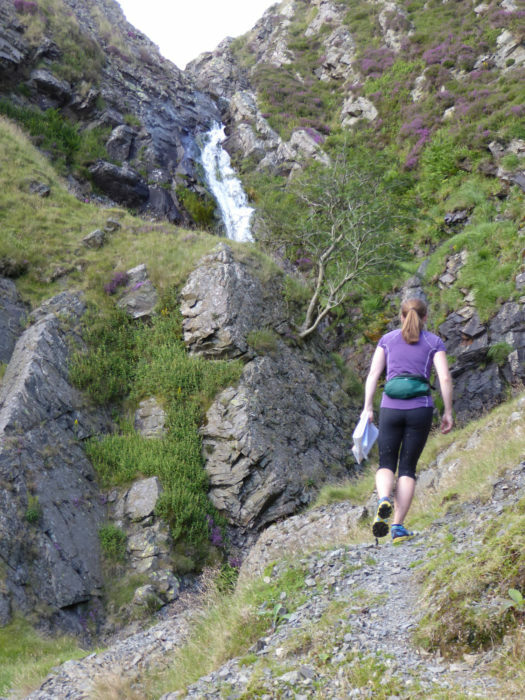 Soon after the start, you are on a bridge overlooking Hell Gill: a sinuous, narrow limestone gorge that is well worth exploring in dry weather and which makes a short, wet but fantastic through trip with plunge pools and a near caving experience. 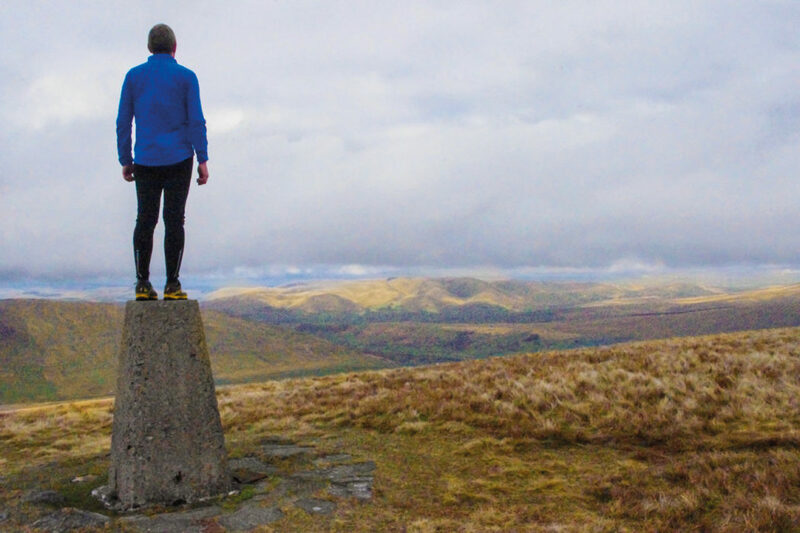 What follows is a steady run north through the valley, all the while with the imposing eastern profile of Wild Boar Fell keeping you company, to reach a stone sculpture – the Water Cut. The fascinating view through the sculpture matches the course of the River Eden flowing behind. The ascent of Wild Boar Fell itself is steep and starts by passing beneath the famous Settle to Carlisle railway line. Turning south from the col brings you to The Nab and the stone cairns that mark the summit plateau follow soon after. 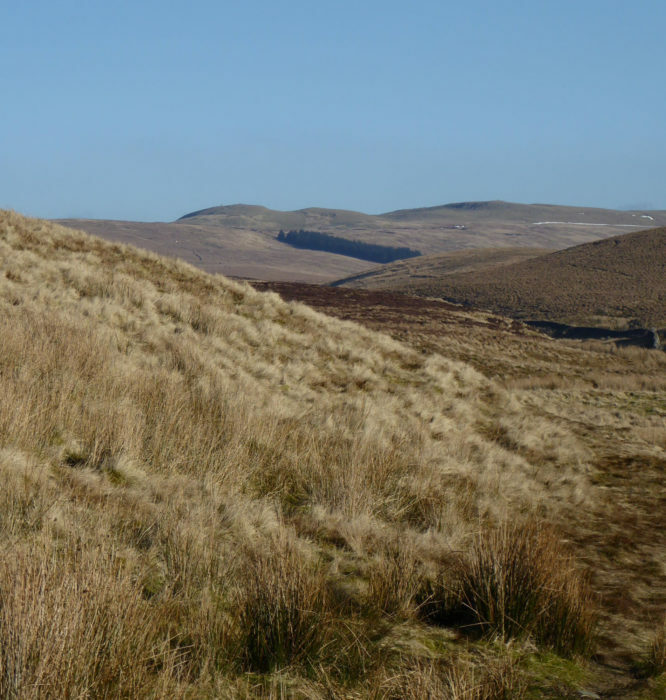 A short grassy section leads across the plateau to the trig point. From here, the route goes south following small grassy paths over Swarth Fell before descending across tussocky moorland back to the start. 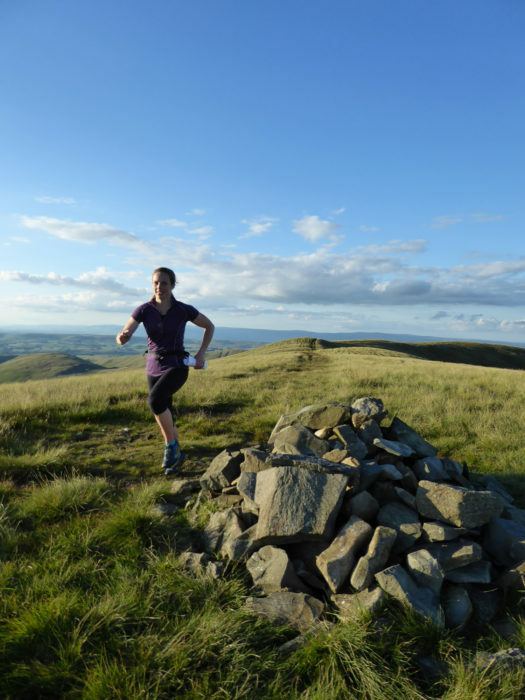 So Wild Boar Fell is a contender because of the remote mountainous feeling (it feels like being in Scotland at times), plus the fact that you need to be a competent, self-sufficient runner and navigator to get the best from the route, making it more outstanding. This is the final contender and has a bit of everything in its favour. Starting with the fact that my first attempt at any guidebook was A Guide to the Dales Way, handwritten more than 30 years ago for my Queens Scout Award. 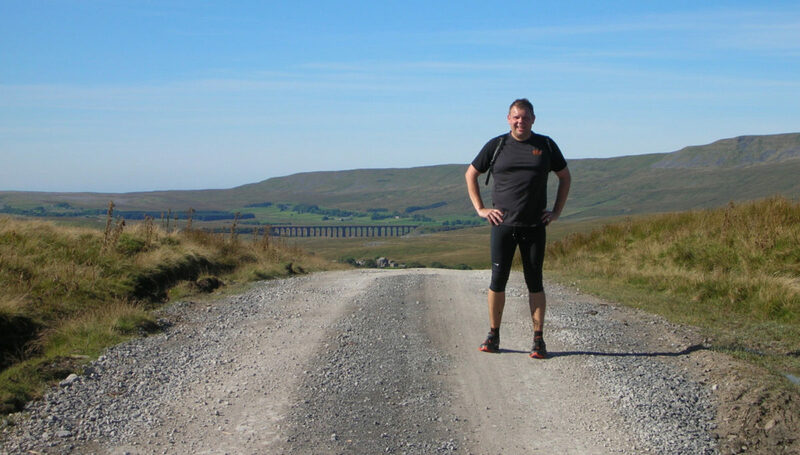 The run follows the Dales Way for a good part of the route. The run up Cosh is generally straightforward, following the Cam Road, an old Roman Road that leads from Gearstones in Ribblesdale to the Roman Camp at Bainbridge in Wensleydale. Hundreds of years ago, large cattle fairs were held near the start of the route. 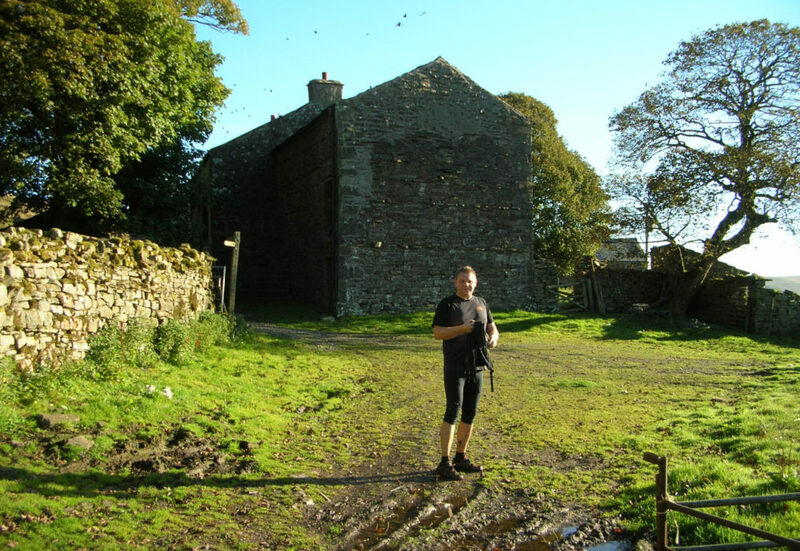 The route leaves the Cam Road and descends to one of the most isolated farms in the area at Cam Houses. Here it follows the Dales Way east along Oughtershaw Beck, which is one of the main tributaries of the River Wharfe. A short road section leads to Beckermonds where Green Field Beck joins and the river becomes the Wharfe. A steep mile of climb leads to the summit ridge. Turning west begins the long traverse that finally leads you to the remote trig point that marks the summit of Cosh. From here you get excellent views over most of the Dales, with the iconic mountains of Ingleborough and Pen-y-ghent close by. From here the navigation can get a bit tricky, needing care and attention. Small paths lead you to where the route meets the Pennine Way. This is followed northwards past potholes, with streams cascading into them, and the limestone gorge of Ling Gill to join once more with the Dales Way and the outward route. This last section is tough as it is mainly up hill. I love this route because it is easy to get to yet has a remote feeling, and is difficult enough to make you feel like you have earned the gorgeous views. So, which is my favourite? In a sense they all are. They are all about the journey through the landscape and less about summiting a peak. These routes are less about following obvious paths, but more to do with exploring. They are also a mix of the popular and less frequented. Overall, Ingleborough is a close second, mainly due to its proximity to home and for being such a wonderful mountain to climb. The run along the escarpment with the face of Ingleborough to look at always inspires me. However, if I could pick only one then I would choose Cosh. To me it epitomises my personal identity as a runner. It is not about following easy paths but about smaller ones that lead to out-of-the-way places. Cosh is close enough to the main peaks that you always feel that you are in the hills, surrounded by fantastic mountain landscapes. While some sections are easy to follow, others are not, and they require a good deal of route-finding ability to reach the summit. 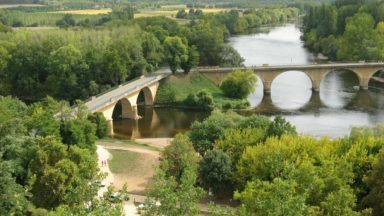 It also has an imposing sense of history from the Romans to the 20th Century. It reminds me that we are lucky indeed to be living in an age where the leisure activity of running is a fine thing.